Infiniti previewed its future EV when it showed the LE concept sedan at last year's New York auto show. The car's 2015 launch date has been pushed back, but a top executive says the car is “not significantly” delayed. 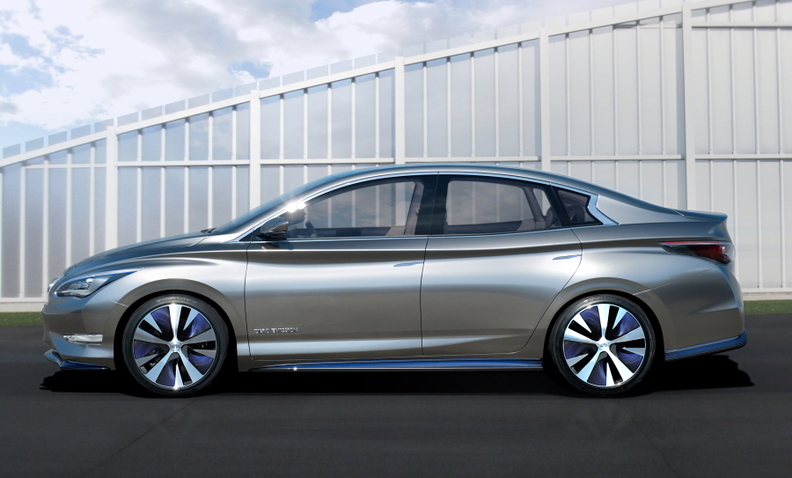 Production of Infiniti's electric car has been delayed in hopes of implementing more sophisticated technology into the vehicle, a top Nissan executive said earlier this month. Andy Palmer, Nissan Motor Co.’s head of global planning, told Automotive News Europe earlier this month that the company needed more time to develop several key components, including wireless induction charging and new lithium ion battery technology. Palmer said the company has not been able to find a wireless induction system that is better than the products currently on the market. There has also been a lack of regulatory compliance, he said. In addition, Infiniti is waiting to implement new lithium ion battery technology that would increase the car’s range at a lower price, Palmer said. The LE concept had been scheduled for launch in 2015. Palmer would not expand on when the company expects to debut the car, saying only that the delay was not significant. “It’s still within our mid-term plan,” he said. Though some EV manufacturers have had trouble selling their vehicles, Infiniti’s parent has actually run out of them. Nissan is selling the Leaf at more than 2,000 a month, quadruple its year-ago volumes. Erik Gottfried, Nissan’s director of electric vehicle sales and marketing, said Nissan won’t be able to fully satisfy all of its dealers until late fall. Though electric vehicles were previously popular only in “green” cities on the West Coast, dealers throughout the U.S. have been asking for more Leafs, Gottfried said. Palmer told The Wall Street Journal, in a report posted on its Web site Tuesday, that innovations in technology are making EVs like the Leaf more affordable and more attractive to consumers. Palmer told the Journal that Nissan wants to sell its electric vehicles in India. He said the company has resolved issues with operating an electric car battery in the country’s warm climate. Nissan has sold about 65,000 Leafs worldwide since it debuted in December 2010, according to the Journal. Adam Rubenfire contributed to this report.